Leonardo Da Vinci was born in 1452 and he died in 1519 at the age of 67. He was born in a small village called Anchiano, close to a town called Vinci. He was born to a peasant family. His education was basic for the time, and he had a hard time accepting the fact that there was a higher education to be had. When he turned 14, he was bound as an apprentice to the painter and sculptor, Verrocchio. Here, he was introduced to painting and drawing, but also plaster casting, metal work, carpentry, mechanics, and perspective. In his life, Da Vinci had many achievements. These could be inventions, sketches, sculptures, or paintings. Some of these would be the Vitruvian man, the Mona Lisa, or the flying machine. He once also created a large clay horse that he intended to be covered in bronze. Da Vinci was many things- an engineer, a painter, a sculptor, and an architect. He was given permission by the Pope to study corpses for better information on the human body, and he was also the first person to study the development of a child in the womb. The Pope gave the permission to Da Vinci because there were rumors around that da Vinci was a sorcerer. Leonardo Da Vinci was brilliant and unique. His ideas were everywhere and spread fast. 500 years ago he had ideas no other man could imagine. Even though the church was strictly against surgical procedures he did exactly that. He found out more about the body then anyone else in his time period. His anatomy research started in 1489 his goal was to record birth, life and death of man. At night he spent his time dissecting bodies by candlelight. He painted every little detail while covering his nose and mouth with a cloth. His work was never published and his knowledge never passed down. If his knowledge would have been published, science and medicine would have been at a totally different level. After Leonardo da Vinci died, his work was supposed to be published but became forgotten. His work was only discovered 150 years ago and they are still finding his work. If his work would have been published in the Renaissance they would have been 350 years ahead of medicine. He was the first person who studied the development of the child in the womb. To get models of the human organs he would take a human organ and cast it and then wait till it was dry and then take it off and make the model out of it. His art skills helped him sketch the sketches of the human very precisely. His knowledge and skill was so advanced that he even developed a theory of the perfect human body called the Vitruvian man. 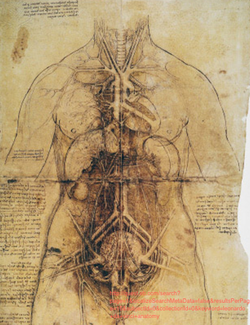 Even though Leonardo da Vinci worked on anatomy every second of his free time, he is still not considered an anatomist. After 20 years off hard work on anatomy he stopped and went to Milan with King Louise the 7th. In 1508 he continued his anatomy research. By then he had made a big break-through in his science career- he had developed a theory of four forces that empowered the world (the forces are weight, movement, force and percussion). He linked this to the human body by making experiments on how the human body would react to the four powers. To accomplish his results he had to dissect about 30 bodies. To reach what he did in one lifetime is basicly impossible. He died in the belief his knowledge would be passed on. But it wasn’t until it was discoverd 150 years ago. Even though the Catholic Church was against surgical procedures he received special permission to dissect a human body. His work would have brought the medicine of the renaissance to a level that was reached 350 years later. But with his death all his knowledge died with him. 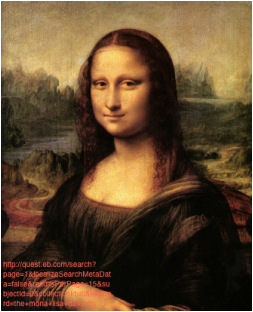 The Mona Lisa actually does have eyebrows… someone studied very closely and saw that da Vinci had decided one brushstroke would suffice for the eyebrows. Also, people were confused by why da Vinci had placed her arm lying across her stomach, but at further examining, someone noticed that her wrist was in place to hold a blanket over the lower half of her body. The Mona Lisa is the most recognized painting in the world. There was an important copy of the Mona Lisa found in Madrid. It is so alike to the real Mona Lisa that some believe that it was painted by someone sitting exactly next to Leonardo and copied every brushstroke. This copy is preserved better than the Mona Lisa itself, and from this painting some people have almost figured out what the Mona Lisa would have looked like when it was originally painted. This painting shows the scene where Jesus is dining with his twelve apostles for the last time- before one of his own, Judas, betrays him and Jesus gets crucified. This painting is in terrible condition from many things- old and new. Some old things would be the technique it was painted, its location (in the dining room of the Santa Maria della Grazie Convent in Milan), the materials used for the paintings. Some newer reasons would be there was a bombing once in the church where it was once housed, air pollution, and tourists. There have been seven previous restoration projects on this painting, and it is undergoing one now. It is said that da Vinci has two extremely famous paintings- the Mona Lisa, and this painting, The Last Supper. When da Vinci was creating this painting, he was experimenting and he used tempera and oil paints to paint this painting. In this painting, Jesus has just declared that one of his disciples would betray him and they are all speaking amongst themselves in groups, discussing who they think it is. Normally, in other painting portraying this scene, Jesus and the disciples are calm and sitting in a row, while it almost seems as if Judas is being shunned, as he is separated from the rest. In 1482, the Duke of Milan asked da Vinci to create this large sculpture of a horse. This sculpture was to be in honor of the Duke’s father and to protect his castle. The sculpture was to be cast in bronze, but at the time they were at war with France and the bronze was needed, so the horse was put on hold. Da Vinci never finished it. Leonardo da Vinci was interested in many things, but his favorite subject seems to be giving man the ability to fly. Leonardo da Vinci designed different types of flying machines. For example, he invented the glider, the parachute and the helicopter. He drew over 100 sketches, but there is no proof that he actually built them. Another word for flying machine is ornithopter, in which orni stands for bird. Before he designed the flying machines, Da Vinci studied and dissected birds, bats and kites. These were also the things he was inspired by. He was good at observing and he had a big imagination. The biggest problem for Da Vinci was that there weren’t motors to help lifting the machines off the ground. The glider looks a bit like a bat, or a big bird. For his first gliders, the wings were attached to the human body with straps. Later, he designed a glider with the wings directly attached to the body. The pilot controls the wings with chords. the glider is powered by the wind, but it probably can’t fly because it is too heavy. This is because it was designed with wood, if it was built now with lighter materials it might be able to fly. 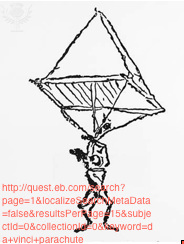 Da Vinci designed a parachute in 1483 in a notebook. It looks a bit like a pyramid. The structure is supported by wooden poles. It is about seven meters long. In his notebook he says: “If a man have a tent made of linen of which the apertures (openings) have all been stopped up, and it be twelve braccia (about 23 feet) across and twelve in depth, he will be able to throw himself down from any great height without suffering any injury.” In 2000 it was tested, and Leonardo da Vinci was proved right because the tester said it was a smoother ride than the parachutes we have now. The design of the helicopter was drawn in 1493 by da Vinci. It was the first helicopter ever designed, and the first helicopter that ever successfully flew was 450 years after that. He was inspired by the seed of the maple tree because when you drop then they spiral down like a helicopter. The design can also be called the Aerial Screw. Leonardo da Vinci's helicopter design is human powered, but it would be too hard for humans to power this machine. It worked by having two people standing on the circular platform and pushing the shaft in circles so that the blades would rotate. In his notes he said that if the helicopter was tested, it should be tested above water so that the pilot could land without injuries.